The middle of a ship. Heavy material that is placed in the hold of a ship to enhance stability. A piece of timber perpendicular to the sides of a ship which supports the deck. Also used to identify objects in relation to objects perpendicular to the ship that are visible from the port or starboard side. The lowest part inside the ship, within the hull itself which is the first place to show signs of leakage. The bilge is often dank and musty, and considered the most filthy, dead space of a ship. Water inside the bilge, sometimes referred to as "bilge" itself. A box on the deck of a ship holding the ship’s compass. A horizontal pole along the bottom edge of a mast to which the mast is fastened. A chain or other obstacle strung between two points across a body of water to impede navigation, sometimes strung between a boat and shore. A boom blocking the River Foyle during the Siege of Londonderry. The slanted spar at a ship's prow jutting out in front of the ship. It is usually used as a lead connection for a small navigational sail. Fun fact: It was from the bowsprit that Blackbeard's head was hung as a trophy. A general term for the vantage on another ship of absolute perpendicular to the direction it is going. To get along broadside a ship was to take it at a very vulnerable angle. This is of course, the largest dimension of a ship and is easiest to attack with larger arms. A "Broadside" has come to indicate a hit with a cannon or similar attack right in the main part of the ship. A partition or dividing wall within the hull of a ship. A small platform, sometimes enclosed, near the top of a mast, where a lookout could have a better view when watching for sails or for land. The section of the upper deck of a ship located at the bow forward of the foremast. A superstructure at the bow of a merchant ship where the crew is housed. A board or ramp used as a removable footway between a ship and a pier. A passage along either side of a ships upper deck. An interjection used to clear a passage through a crowded area. The elevated side edges of a boat which strengthen its structure and act as a railing around the gun deck. In warships the gunwale has openings where heavy arms or guns are positioned. The steering wheel of a ship which controls the rudder. A large area for storing cargo in the lower part of a ship. A rope ladder with wooden rungs used to access a ship from the side. The underside of a ship which becomes covered in barnacles after sailing the seas. A small anchor, especially one made of a stone in a wooden frame. The side away from the direction from which the wind blows. The largest and, perhaps, most important mast. 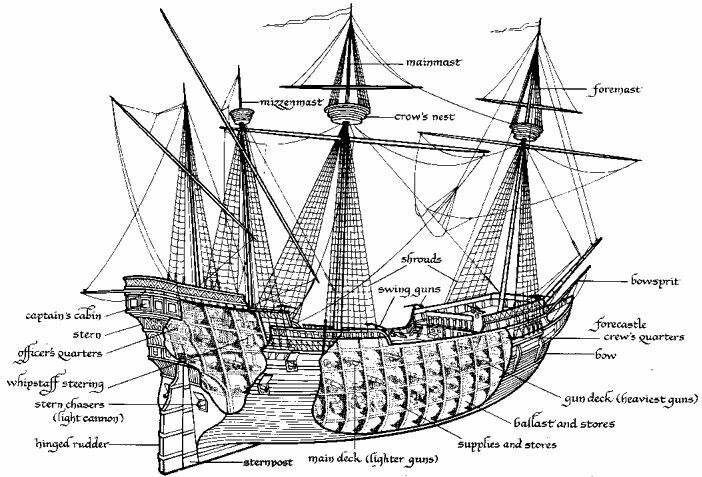 It is the third mast or the mast aft of a mainmast on a ship having three or more masts. The highest deck at the stern of a large ship, usually above the captains quarters. The longest mast located in the middle of a ship. The left side of the ship when you are facing toward her prow opposite of starboard). The forwardmost area of the ship. The after part of the upper deck of a ship. An underwater obstruction of rock or coral which can tear the bottom out of a ship. The system of ropes, chains, and tackle used to support and control the masts, sails, and yards of a sailing vessel. A flat piece of wood at the stern of a ship that dips into the water and is used for steering. The rudder is controlled at the helm. Openings along the edges of a ship's deck that allow water on deck to drain back to the sea rather than collecting in the bilge. A small opening or hatch with a movable lid in the deck or hull of a ship. To sink by means of a hole in a ships hull. The right side of the ship when you are facing toward her prow (opposite of port). An upright beam at the stern bearing the rudder. The lower forward corner of a fore-and-aft sail. The position of a vessel relative to the trim of its sails. The act of repositioning a sail in order to change which side the wind catches it. Any of several transverse beams affixed to the sternpost of a wooden ship and forming part of the stern. Either end of a yard of a square sail. The main arm across the mast which holds up the sail. 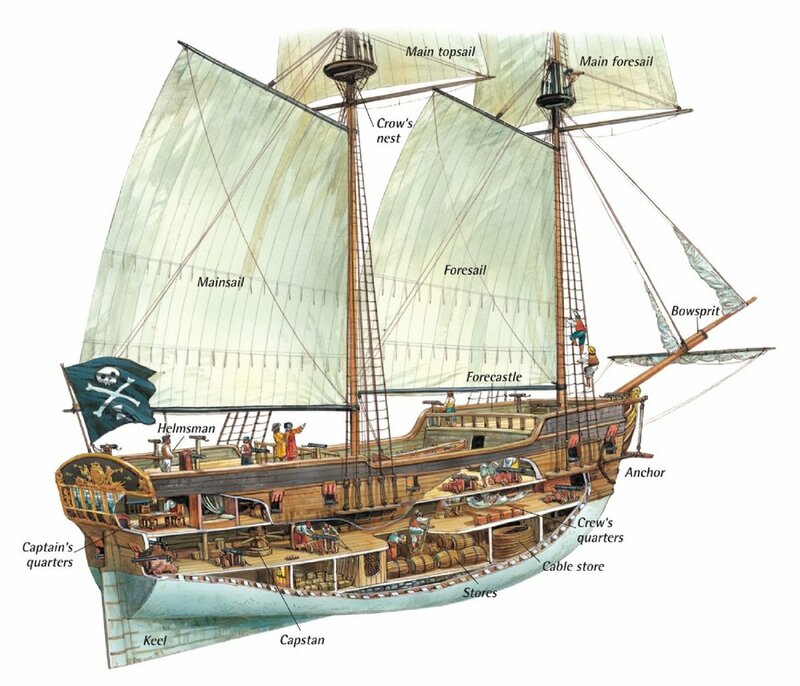 The yardarm is a vulnerable target in combat, and is also a favorite place from which to hang prisoners or enemies. Black Bart hung the governor of Martinique from his yardarm.